The best way to check the print quality, paper alignment etc before starting a large print run, is to create the actual print file (with all the tickets) and just print a single page or 2 first to test. 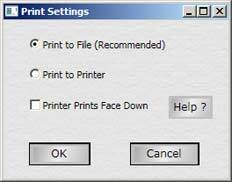 Click the Printing button, leave default Create Print File radio button selected and click OK to create and open the Print File. From the opened print files' File menu, select Print and set from ~ to page numbers to a single page to print.